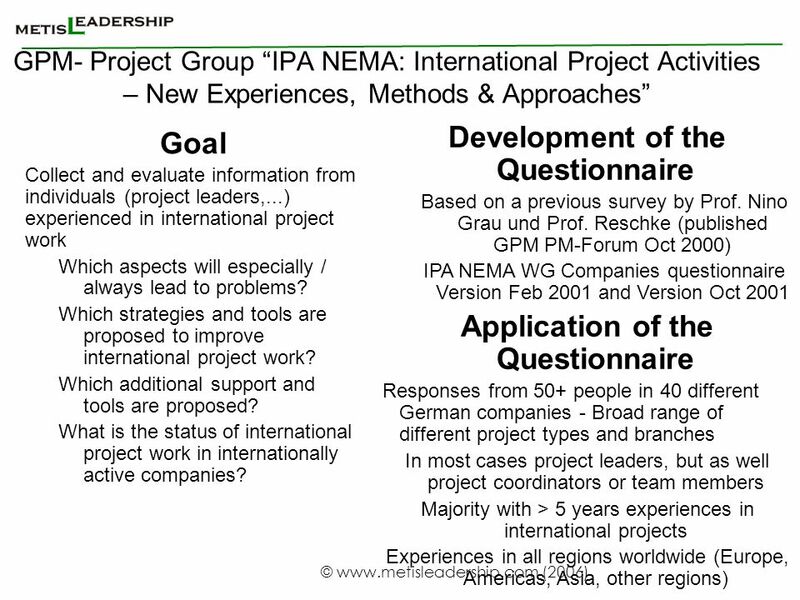 GPM- Project Group “IPA NEMA: International Project Activities – New Experiences, Methods & Approaches” Development of the Questionnaire Based on a previous survey by Prof. Nino Grau und Prof. Reschke (published GPM PM-Forum Oct 2000) IPA NEMA WG Companies questionnaire Version Feb 2001 and Version Oct 2001 Application of the Questionnaire Responses from 50+ people in 40 different German companies - Broad range of different project types and branches In most cases project leaders, but as well project coordinators or team members Majority with > 5 years experiences in international projects Experiences in all regions worldwide (Europe, Americas, Asia, other regions) Goal Collect and evaluate information from individuals (project leaders,...) experienced in international project work Which aspects will especially / always lead to problems? 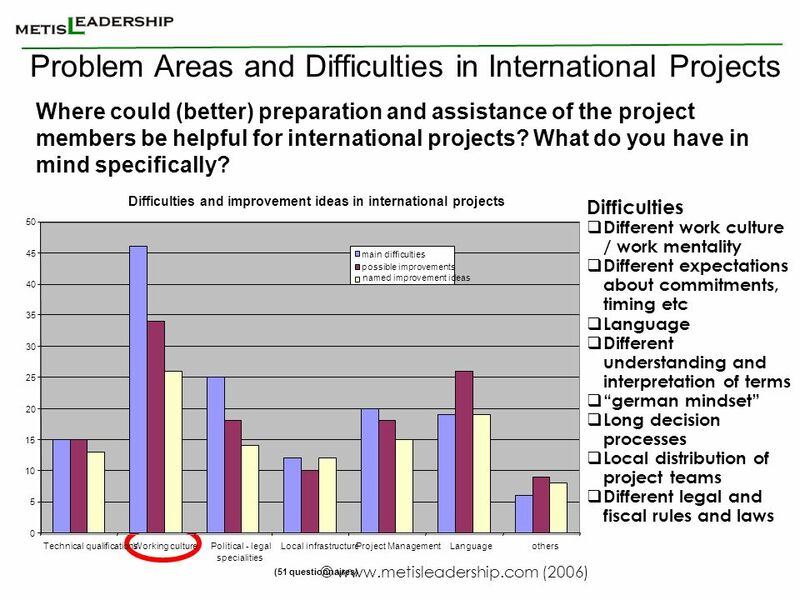 Which strategies and tools are proposed to improve international project work? Which additional support and tools are proposed? 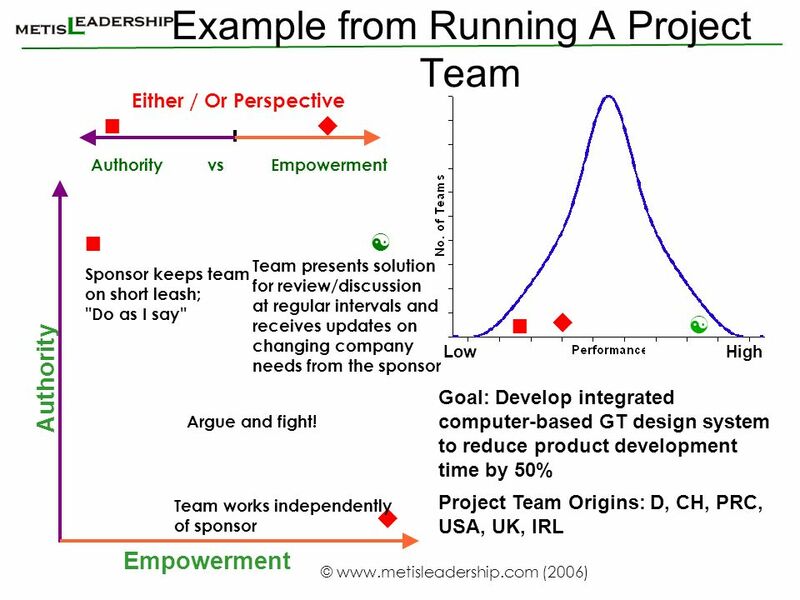 What is the status of international project work in internationally active companies? 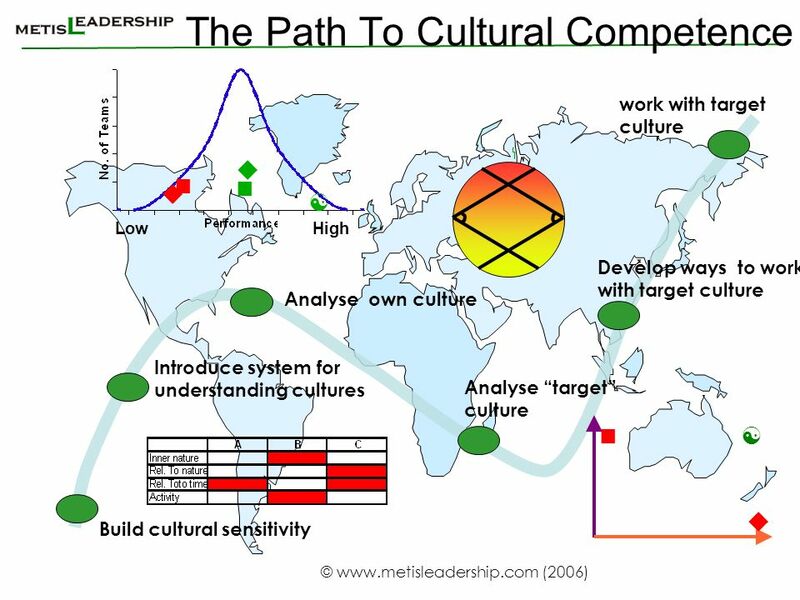 Success in international projects is also a question of the personal competence of those who are involved. 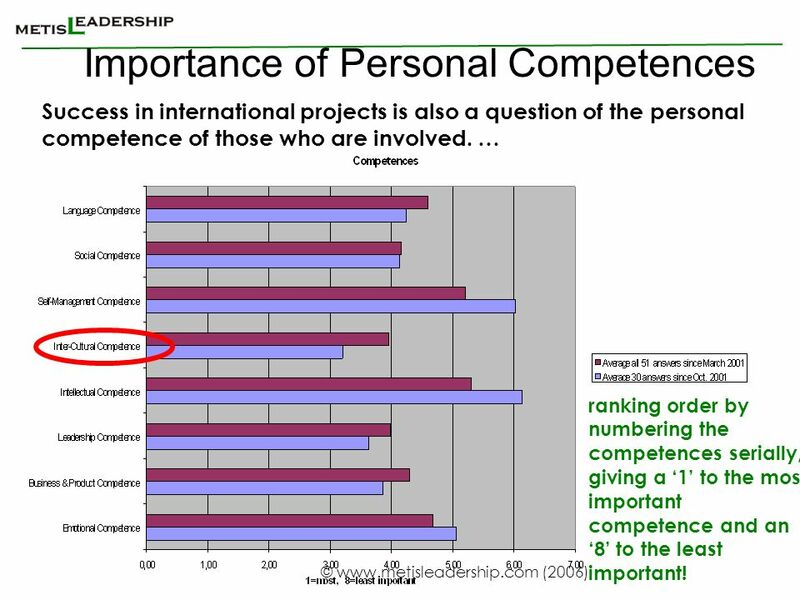 … ranking order by numbering the competences serially, giving a ‘1’ to the most important competence and an ‘8’ to the least important! 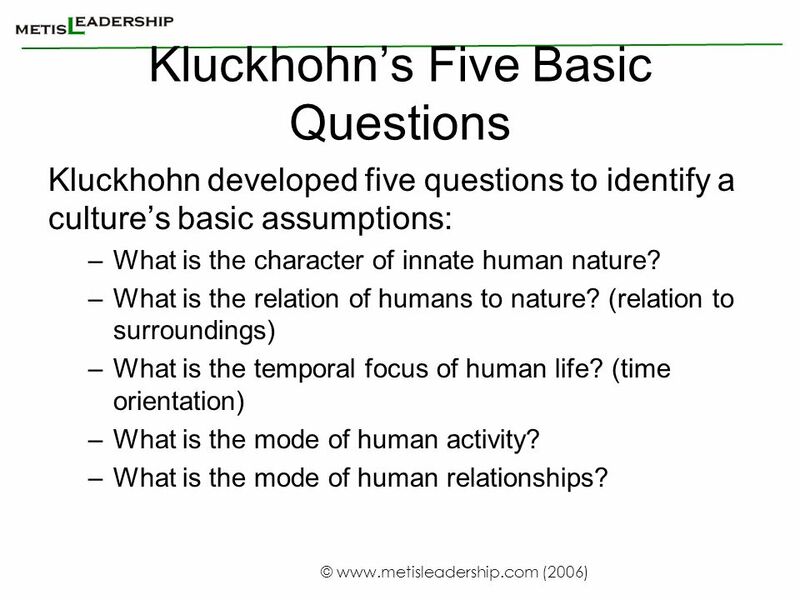 Kluckhohn developed five questions to identify a culture’s basic assumptions: What is the character of innate human nature? What is the relation of humans to nature? 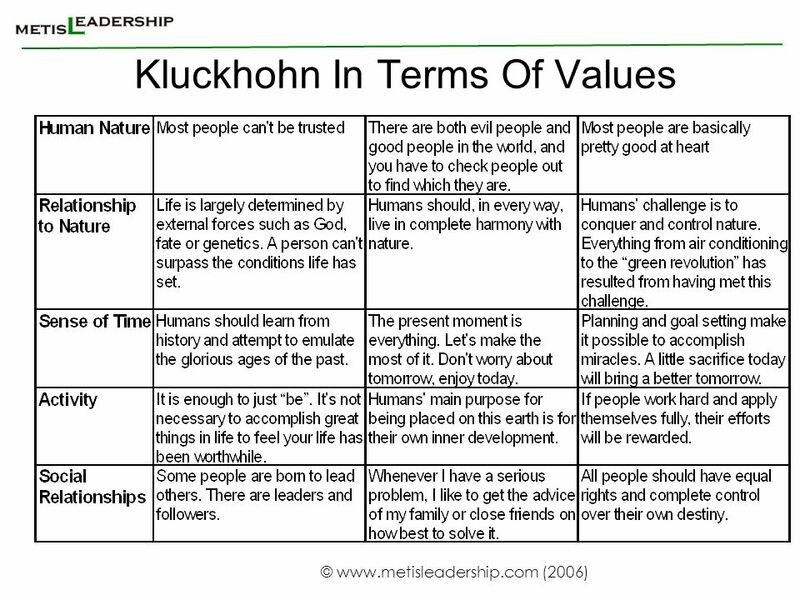 (relation to surroundings) What is the temporal focus of human life? 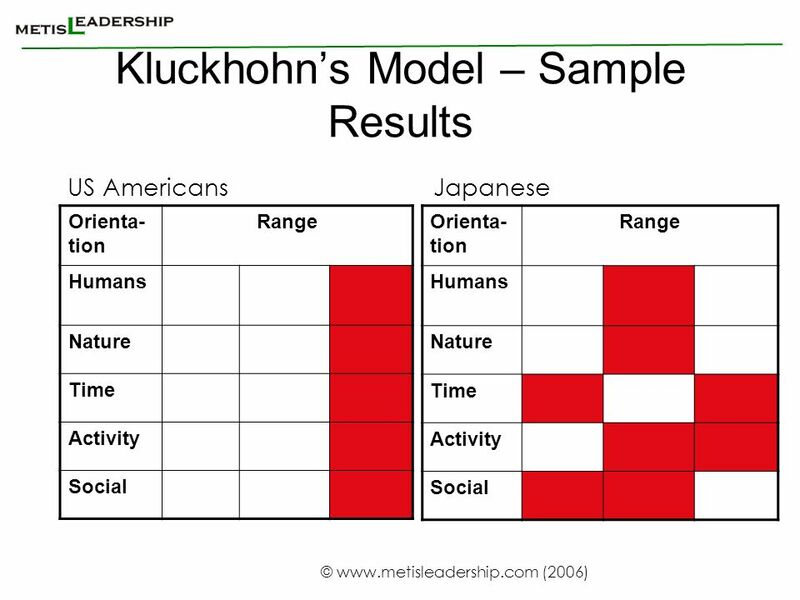 (time orientation) What is the mode of human activity? 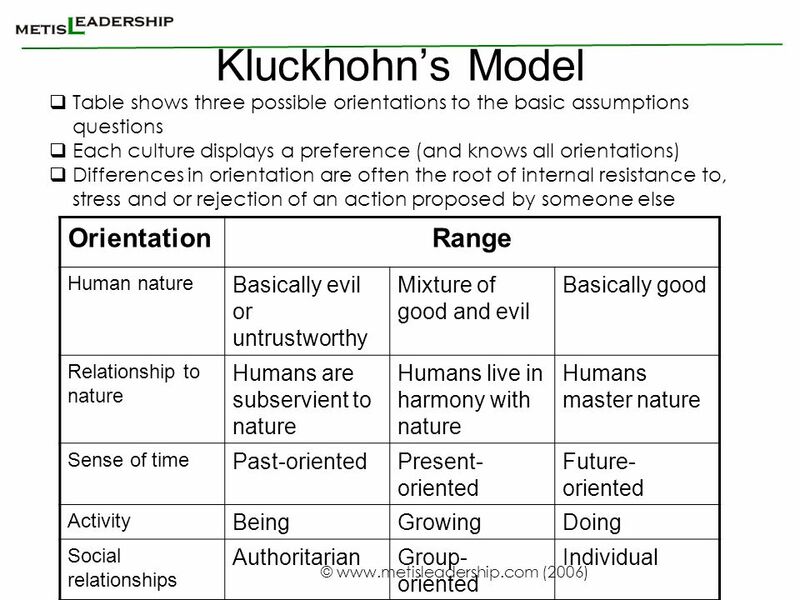 What is the mode of human relationships? Travel in a spirit of humility and with a genuine desire to meet, talk with local people. Do not expect to find things as you have them at home for you have left your home to find things different. 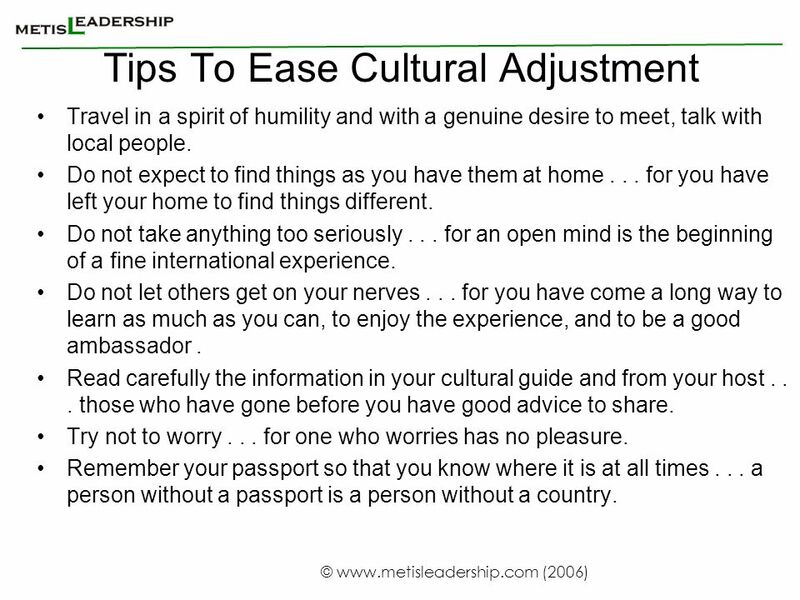 Do not take anything too seriously for an open mind is the beginning of a fine international experience. Do not let others get on your nerves for you have come a long way to learn as much as you can, to enjoy the experience, and to be a good ambassador . Read carefully the information in your cultural guide and from your host those who have gone before you have good advice to share. Try not to worry for one who worries has no pleasure. Remember your passport so that you know where it is at all times a person without a passport is a person without a country. Do not judge the people of a country by the one person with whom you have had trouble for this is unfair to the people as a whole. You shall remember that you are a guest in every land for one who treats a host with respect will be treated as an honoured guest. Cultivate the habit of listening and observing Realize that other people may have thought patterns and concepts of time which are very different than yours - not inferior, just different. Be aware of the feelings of local people to prevent what might be offensive behaviour. For example, photography must be particularly respectful of persons. 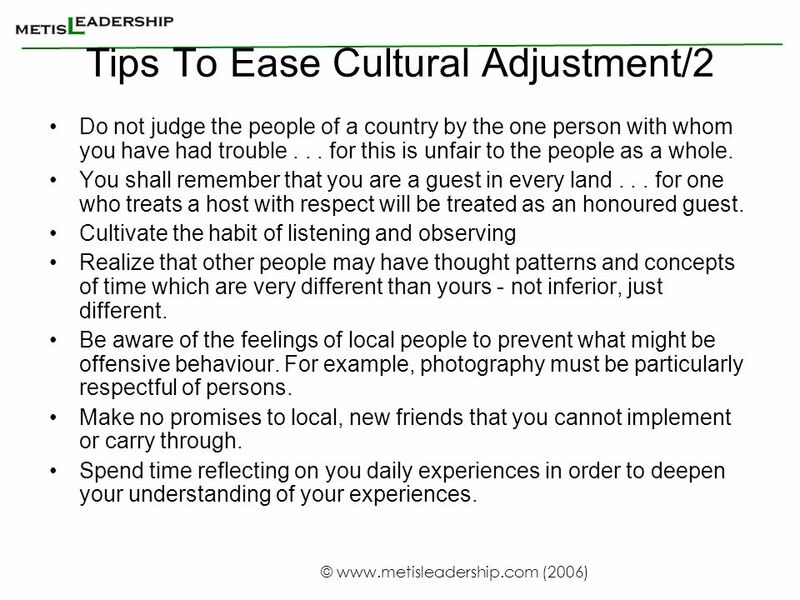 Make no promises to local, new friends that you cannot implement or carry through. Spend time reflecting on you daily experiences in order to deepen your understanding of your experiences. 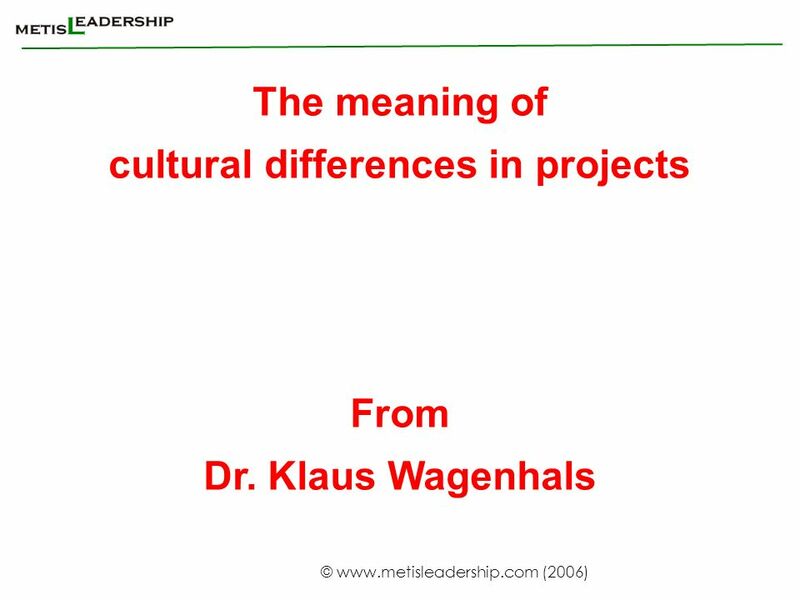 Download ppt "cultural differences in projects"
1 Transitions Coping With Change Ruth Roberts Educational Counsellor University Counselling Service. Great idea but just no time: Teachers views of research and its role in their professional lives Simon Borg Centre for Language Education Research School. UNIVERSITY OF ECONOMICS IN BRATISLAVA, SLOVAK REPUBLIC INTERNATIONAL NEGOTIATION – UCL – JANUARY, 2014 lecturer Milan Oresky. On the Ground: Negotiating Native Title. Yamatji Marlpa Aboriginal Corporation (YMAC) is the native title representative body for the Pilbara, Murchison. Inclusive teaching in psychology Dr Julie Hulme. To introduce you to your students – diversity of psychology students; To reflect on how your teaching. 1 From Formative to Instructional Practice Kelly Oglesby, Chief Information Office Data Tools Team Elementary Language Arts and Social Studies Data Analyst. 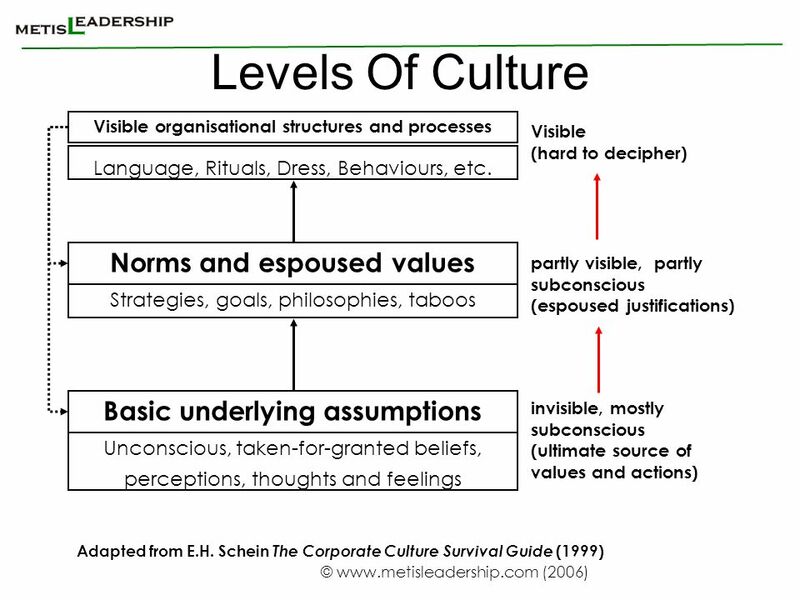  A pattern of basic assumptions that are considered valid and that are taught to new members as the way to perceive, think, and feel in the organization. Networking for Success. Session Outcomes Establish what it really is Plan and prepare to make the most of the experience Identify your networking style. 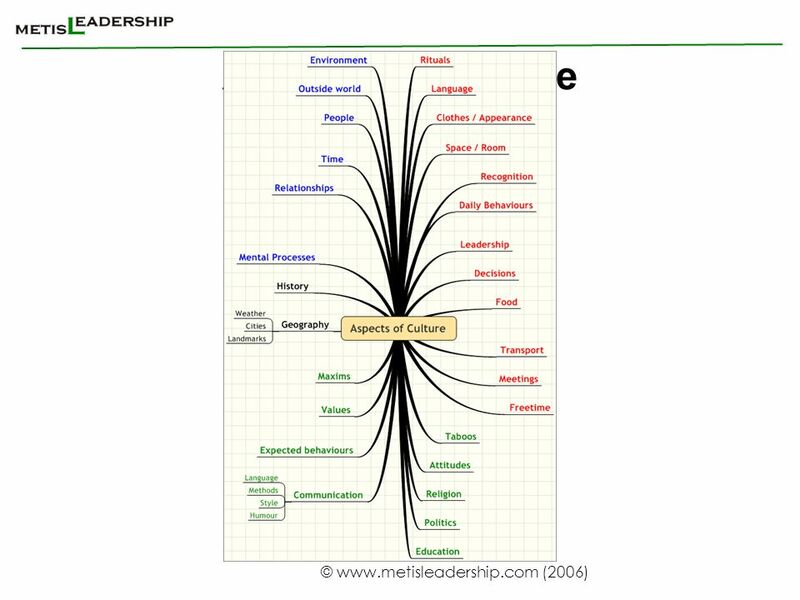 Copyright ©2009 South-Western, a division of Cengage Learning All rights reserved Chapter 16 Organizational Behavior Nelson & Quick 6th edition Organizational.